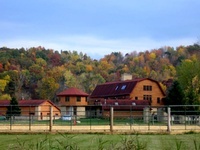 Welcome to Cedar Valley Preserve... the Midwest's most complete, upscale lodge and hunt club. Nestled in the wooded hills of Spring Green, Wisconsin, Cedar Valley Preserve claims 500 acres of unglaciated countryside bordering the Lower Wisconsin State Riverway. This driftless fortress unveils a landscape of rolling hills, rugged sandstone bluffs, rock ravines and open fields offering both beautiful scenery and a bounty of recreation. 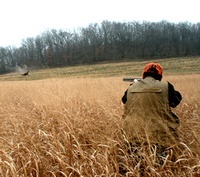 Cedar Valley Preserve has rapidly become Southern Wisconsin's premier destination for upland game hunting, turkey hunting, and is highly regarded as a quality deer-managed property for white tail bow hunting. Unlike traditional hunt clubs, Cedar Valley Preserve is known for its personable, family-orientated atmosphere and rustic charm thus a popular retreat for sportsmen, nature enthusiasts, families and friends. We invite you to browse our website, get to know us, ask questions and share the Cedar Valley experience with your clients, family and friends. Whether you'd like to book a hunt, indulge in a weekend get-away or desire a place to host a special event or wedding, consider Cedar Valley your primary destination. Give us a call today... we'd love to have you as our guest!